The potato is a starchy, tuberous crop from the perennial nightshade Solanum tuberosum. The word "potato" may refer to the plant, itself, in addition to the edible tuber. In the Andes, where the species is indigenous, there are some other closely related cultivated potato species. Potatoes were introduced outside the Andes region four centuries ago, and have become an integral part of much of the world's food supply. It is the world's fourth-largest food crop, following rice, wheat and maize. Long-term storage of potatoes requires specialised care in cold warehouses. Potato plants are herbaceous perennials that grow about 60 cm high, depending on variety, the culms dying back after flowering. They bear white, pink, red, blue, or purple flowers with yellow stamens. In general, the tubers of varieties with white flowers have white skins, while those of varieties with colored flowers tend to have pinkish skins. Potatoes are cross-pollinated mostly by insects, including bumblebees, which carry pollen from other potato plants, but a substantial amount of self-fertilizing occurs as well. Tubers form in response to decreasing day length, although this tendency has been minimized in commercial varieties. After potato plants flower, some varieties produce small green fruits that resemble green cherry tomatoes, each containing up to 300 true seeds. Potato fruit contains large amounts of the toxic alkaloid solanine and is therefore unsuitable for consumption. All new potato varieties are grown from seeds, also called "true seed" or "botanical seed" to distinguish it from seed tubers. By finely chopping the fruit and soaking it in water, the seeds separate from the flesh by sinking to the bottom after about a day (the remnants of the fruit float). Any potato variety can also be propagated vegetatively by planting tubers, pieces of tubers, cut to include at least one or two eyes, or also by cuttings, a practice used in greenhouses for the production of healthy seed tubers. Some commercial potato varieties do not produce seeds at all (they bear imperfect flowers) and are propagated only from tuber pieces. Confusingly, these tubers or tuber pieces are called "seed potatoes," because the potato itself functions as "seed". Eating potatoes can reduce inflammation. Potatoes are wholesome, nightshade vegetables, loaded with carbohydrates, protein, calcium, niacin and Vitamin C. Because of the fiber in potatoes, they are soft and easily digested. The Vitamin C in potatoes make them great antioxidants which repair cells in the body. Potatoes can relieve inflammation in the intestines and digestive track. Raw potatoes can also be mashed and applied to relieve external burns, inflammation, and so forth. Eating potatoes can increase brain function. The brain or nerve center of your body relies on several things to function, including balanced glucose levels, oxygen, Vitamin B complex, amino acids, Omega-3 and other fatty acids, among others. Potatoes contain these elements and so much more to keep your brain performing as it should. Eating potatoes can help prevent cardiovascular disease. Potatoes are a great source of carbohydrates, protein, calcium, niacin and Vitamins C and B-complex. These properties help fight heart disease and keep blood pressure at normal levels. Potatoes also contain carotenoids, key to heart health and overall health and wellness. Potatoes may offset incidence of kidney stones. There are an increasing number of studies that indicate that potatoes may have protective health benefits. For example, potatoes are rich sources of magnesium which can offset the accumulation of calcium in the kidney. Potatoes advance skin care. Potatoes have all the right stuff to optimize health and wellness. Potatoes contain Vitamins C and B-complex, potassium, magnesium, zinc and phosphorus, all excellent vitamins and minerals for your skin. Raw potatoes can be mashed and mixed with honey to make a masque for your skin. 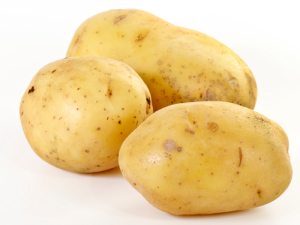 Raw potatoes can also be applied to burns and rashes to ease the swelling and pain. You'll also need to limit the number of potatoes eaten with each meal.